The Rockport Film Review: "God Bless America" Dark Comedic Fun! 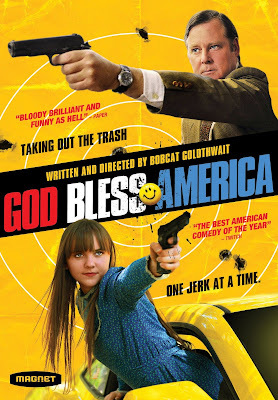 Dark comedies don't get much darker (or funnier) than 2012's "God Bless America". Written and directed by 80s comedian Bobcat Goldthwait, who's last directed Robin Williams a few years ago in another dark comedy called "World's Greatest Dad". In "God Bless America" middle-aged everyman Frank (played by Joel Murray) is fed with society becoming meaner and meaner. Kids have developed such a sense of entitlement and self-centered greed that the future of human decency looks bleak. Parents aren't any better as they have stopped being "parents" to their kids. Reality shows, cable news, and rewarding human stupidity are rotting a society from the inside out. Frank is divorced and lives in a cheap apartment with loud and inconsiderate young neighbors whose baby cries at all hours. Lying in bed one night he has a seriously demented fantasy that I sure most people have had at one time or another. Frank works in a generic office building with annoyingly stupid co-workers and mind numbing work. While showing basic human kindness to the receptionist he is fired for "harassing" her. To top it all off his recent headaches have been caused by a brain tumor. At the end of his rope with life and society, he contemplates suicide. While watching a reality show about a spoiled brat named Chloe he decides that she needs to die more. He stakes out her high school and while doing this meets a kindred soul in the form of a teen girl named Roxy (played by Tara Lynne Barr). Frank and Roxy are a great duo but are strictly platonic friends as Frank is a very moral person who thinks people have lost their basic decency and respect for others. This being said they start off on a road trip killing mean people along the way. Obviously, this movie was made before the tragic movie theatre shooting in Colorado, so when Frank and Roxy start killing obnoxious and rude theatergoers it makes this movie all the more darker. The most disturbing part is that your cheering them on while they do it all while thinking this is soooooo wrong. Frank and Roxy are extremely likable and relatable. They have great chemistry and are sort of like a Bonnie and Clyde. This movie does take place in a sort of fantasy world and could very well all be taking place in Frank's head or in a dream. Like a lot of comedies the less you really think about it the better. This movie is extremely satirical and sarcastic and is not for everyone. If you like your comedies like your coffee (black and bitter) you'll love "God Bless America" It is now out on DVD and Blu-Ray and currently available through Netflix Watch Instantly.